An invisible hearing aid unlike anything you’ve seen before. Get a free sample of the best invisible hearing aid. I give Eargo my consent to use automated technology to call or text at my wireless number. I understand I am not required to provide this consent to make a purchase. What use is a non-working fit & feel sample? We get it. A hearing aid sample that doesn't let you hear may sound odd. When shopping for a hearing aid however, some of the most important questions are: 'can I wear this in my ear for long periods?' and 'how visible is the hearing aid when worn?'. 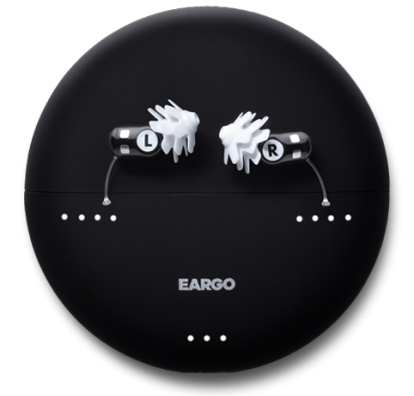 These samples allow you to see how well Eargo's unique open fit design feels and looks in your ear – on your schedule, in the comfort of your home. As for how it sounds? Well that's the next step. And we have an ironclad 45-day trial period that allows you to do just that. "Eargo Max: A Hearing Aid Meant for the Masses." Today over 48 million Americans suffer from some form of hearing loss. Surprisingly less than two in ten do something about it. Often it comes down to cost, comfort and convenience of owning traditional hearing aids. But the number one reason is denial. People just don’t think their hearing loss justifies wearing a clunky piece of hardware behind their ear, telegraphing they have hearing issues. Eargo is on a mission to change all that by creating remarkable hearing aids that addresses all these issues. From a low cost direct-to-consumer model to the unprecedented comfort Flexi Fibers provide to the truly invisibility profile, there’s simply nothing else out there that does it all. At Eargo we believe you should want to wear a hearing aid not have to wear one. Eargo's patented Flexi Fibers let some low frequency (bass) sounds pass through, so only the high frequency (treble) sounds need to be amplified. That means you get to hear every moment. Because life is a symphony of sounds. Now you can experience the world's most innovative and invisible hearing device for about half the price of traditional hearing aids. And with affordable financing options, you can pick them up without your wallet breaking a sweat. *This example payment is the amount of equal monthly payments on a loan to finance the purchase based on the listed product price of $1,650 assuming a 24 month term and a 9.99% APR. Your terms may vary and are subject to credit approval. Rates range from 0% to 29.99% APR. Bread® loans are made by Cross River Bank, Member FDIC.